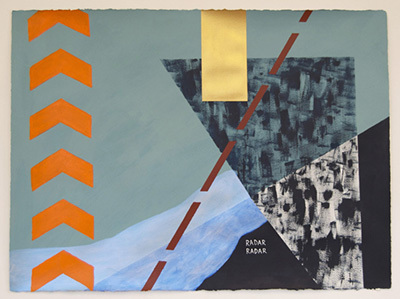 On Thursday October 30, 2014, at 6:30 p.m., visiting artist Dahlia Elsayed will give a public lecture in the Raw Space, 1105 S. Wabash, Room 205. Elsayed combines text and imagery to create visually narrative paintings that document internal and external geographies. Her work, influenced by conceptual art, comics, and landscape painting, is informed by autobiography and environment, to create illustrated documents of places and memories. Frequently using the visual language of cartography, Elsayed’s paintings employ symbols of hard data- geologic forms, borders, markers, coastlines – to frame the soft data of the ephemeral, adapting a quantitative schema to the qualitative. Her paintings, prints and artist books have been shown at galleries and art institutions throughout the United States and internationally, including the 12th Cairo Biennale, and solo exhibitions at Aljira Center for Contemporary Art and the Jersey City Museum. She received her MFA from Columbia University, and lives and works in New Jersey. Elsayed is Assistant Professor of Humanities at CUNY LaGuardia Community College.